I am often puzzled at the things that politicians pretend to care about. There are times when parliament seems to be in a constant state of manufactured outrage - ranting and raving about things that we all know they as politicians don't care about, but things they hope will get the public upset. Such is the political paradigm in Australia today. 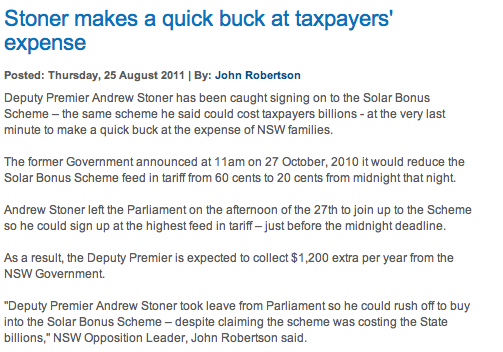 The fuss over Andrew Stoner and the solar feed-in tariff is exactly that. 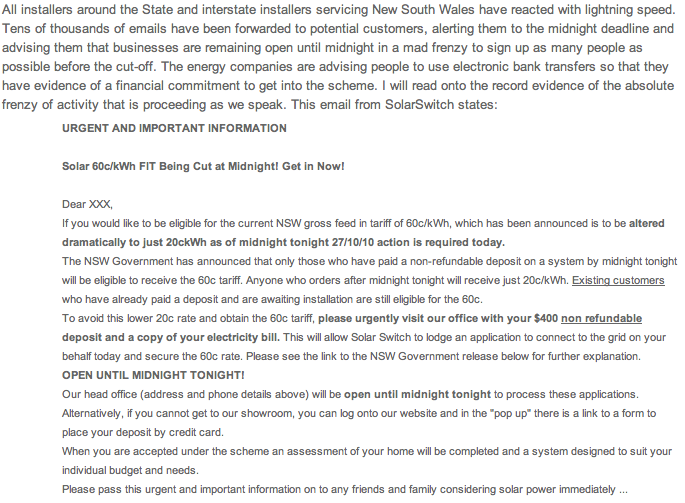 I covered the solar issue a few month ago during O'Farrell's aborted attempt to slash the feed-in rate from apparently unsustainable levels. In short. the Labor government had introduced a tariff of 60c per kilowatt hour for power gathered by solar panels and "fed back" into the network. The scheme was incredibly generous and, unsurprisingly, massively oversubscribed. 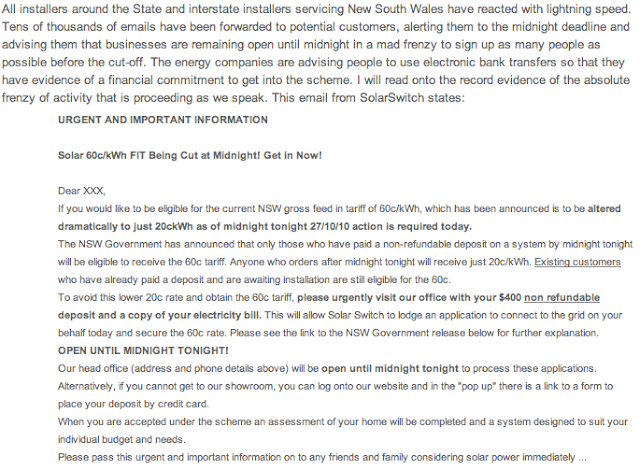 As a result, the Labor government reduced the rate to 20c, but allowed all people who signed up at the 60c to retain that tariff. There was a short debate on the bill between 20:00 and 21:20 and the bill was passed with support from both sides of the chamber. 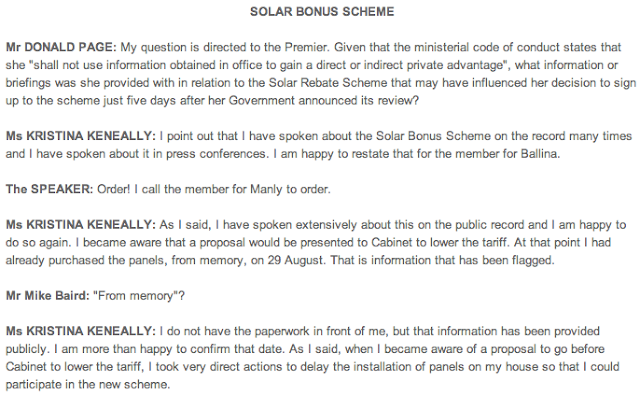 There was outrage from the Coalition a few days later when it was revealed that Keneally had signed up to the scheme before the rate was reduced. She was revealed to have signed up 5 days after the government flagged an intention to review the sceme and less than 2 months before the changes were announced. In any event, Keneally managed to arrange things such that she missed out on the 60c rate regardless. Now, I'm as enthusiastic as the next person when it comes to highlighting hypocrisy. In fact, few things give me more joy than seeing a hypocrite being revealed for who he or she really is. But I'm not sure that the mud here sticks. Firstly - i've had a cursory search of the internet and I cannot find any statement made by Stoner directly in support of the changes. That said, when the tariff was reduced he, along with his party, supported the change. I've also posted the question above asked by one of his Coalition colleagues. I've searched Hansard for 27 October for any mention of Stoner, and there is none. In his press release John Robertson says that he was granted a pair for a portion of that day - presumably the parties keep some record of these things, so I've no reason to doubt that he did indeed pop out of parliament to get the application in. A question from Linda Burney (ALP) on 24 May 2011 challenging Stoner in relation to a written guarantee he gave to a constituent that the bonus scheme would not be amended retrospectively. At the end of the day, the criticism from Labor appears to be that he signed up to the scheme that his party (at the very least, if not Stoner himself) has called a massive waste of government money. The fact that he signed up for the program on the last possible day is thrown in, almost as if to suggest he had some sort of insider knowledge. I have a little trouble getting outraged about that. He didn't break any laws. He didn't lie, cheat or steal. He took advantage of a scheme put in place by Labor that was about to be brought to an end. True, his party did then and has since coming into power criticised Labor's decision to set the tariff at 60c. That said, there are some taxes that I think are too low - but I'm not going to pay extra in (even if I could) because there are other taxes that I think are too high, and I don't expect that excuse to carry much weight with the State Debt Recovery Office. I thought the "metro" train systems proposed by the Labor government were a terrible idea - but had they been built I would see no hypocrisy in using them, given that I as a taxpayer would have funded their construction. I agree that the 60c tariff was far too high - but if I owned a house rather than an apartment you can bet every dollar you have that I would have jumped all over that 60c tariff, and been pretty pleased about the result. Being opposed to a policy doesn't mean you have to be self-righteous about it and refuse the benefit accrued. But he has taken advantage of the opportunity afforded by a particularly stupid Labor policy, as did thousands and thousands of of NSW residents. And that doesn't make him a hypocrite.